Model Number 116234. All diamonds are VS quality and F color. Model Number: 116234. Model: Datejust. I customize each one individually. Factory Rolex warranties are void with these customizations. Up for sale is a Rolex “Oyster Perpetual Datejust” 2-Tone Stainless Steel & Yellow Gold Bracelet Watch w/ Box, Ref 69173. Signed, round, 2-tone stainless steel & yellow gold case no. 2-tone stainless steel & yellow gold Jubilee bracelet with stainless steel Rolex deployant clasp. See the picture of the watch?. This is the exact bezel installed on the datejust, so this is what this bezel will look like on a watch. You will love it! This Dial is for a 36mm Stainless Steel and/or 18K White Gold. Reference Number 116201. The iconic Rolex DateJust in Stainless Steel and 18 kt. The bracelet is the signature three section Oyster design with a center row of yellow gold links bordered by brushed steel links securing on the wrist with the fold over Oysterclasp featuring the 5 mm comfort extension link. Rolex DateJust Black Dial Turn-O-Graph 36mm 16263 Steel 18k Yellow Gold Thunderbird Oyster Band Watch. Model DateJust Turn-O-Graph. Rolex Black Stick Dial with the date at the 3 o'clock. Dial Original. Model Number 179174. Ladies Stainless Steel, 18K White Gold Custom 12 Diamond Bezel. Model Number: 179174. Model: Datejust. Vendor: Rolex. Case Material: Stainless Steel, Rolex uses 904L stainless steel superalloy for it's maximum resistance to corrosion and it is highly polishable. Reference Number 126334. Watch Model Rolex Datejust 41. Box Rolex Box. Papers Rolex card, Watch manuals. Watch Dial Blue. Condition Unworn. We obtain our watches from reputable sources dealing directly with authorized dealers and distributors. Reference Number 126334. Watch Model Rolex Datejust 41. Box Rolex Box. Papers Rolex card, Watch manuals. Watch Dial Blue. We obtain our watches from reputable sources dealing directly with authorized dealers and distributors. Rolex Datejust 178240 Lady 31mm Midsize 18k White Gold & Stainless Steel. with Diamond Lugs, Bezel, Dial, and Band. Looks like the Pearlmaster 81159 model. I LOVE that it is the midsize 31mm case. It's a perfect balance. Reference Number 126301. Watch Model Rolex Datejust 41. Box Rolex Box. Papers Rolex card, Watch manuals. Watch Dial Grey Dial With Green Markers. We obtain our watches from reputable sources dealing directly with authorized dealers and distributors. Watch in very good condition working, got all original. Model Number: 116200. The diamond dial is custom on this watch. The bezel is also custom. I love this bezel! It is as close to the factory Rolex specs as a custom bezel can be. Model: Datejust. Original Rolex Dial with Custom Diamonds and Mother of Pearl. Reference Number 116233. Watch Model Rolex Datejust 36. 36mm stainless steel case, 18K yellow gold fluted bezel, champagne dial, index hour markers, and stainless steel and 18K yellow gold Jubilee bracelet. Rolex Datejust 41mm Stainless Steel & Yellow Gold Green Roman Dial Watch 126333. Reference Number 126333. Watch Model Rolex Datejust 41. Box Rolex Box. Papers Rolex card, Watch manuals. Watch Dial Grey Green Roman Dial. Rolex Datejust 41mm Stainless Steel & Yellow Gold Watch Jubilee Bracelet Watch 126333. Watch Reference Number 126333. Watch Model Rolex Datejust 41. Box Rolex box. Papers Rolex papers. Watch Bracelet Material Stainless Steel / 18K Yellow Gold. Rolex Watch 36mm Date Model # 116200. Model Number: 116200. Each one is customized individually. Factory Rolex warranties are void with these customizations, however, are not irreversible so with a simple swap of an all original dial and bezel, the warranty will be in effect. Rolex Watch 36mm Date Model # 116200. Model Number: 116200. I love this bling look. Each one is customized individually. Factory Rolex warranties are void with these customizations, however, are not irreversible so with a simple swap of an all original dial and bezel, the warranty will be in effect. For sale is a Stunning 18Kt ladies bracelet yellow gold, Diamond Datejust Rolex Wrist Watch containing. 36 Brilliant cut diamonds around the bezel and 6 brilliant cut diamonds on each ear. Signed: Yes. Reference Number 116233. Water resistant 100m. Watch Model Rolex Datejust 36. Papers Rolex card, Watch manuals. Watch Dial Black Roman Dial. Case Material Yellow Gold / Stainless Steel. Bracelet Yellow Gold / Stainless Steel. This is a classic Rolex Oyster Perpetual Datejust 36mm ref. 16234 with a white gold bezel and jubilee bracelet. Two tone w/ steel & gold. No box/papers or original bracelet. This watch has an elegant looking black dial, with brilliant gold hands/Excellent VS-1 clarity/F color diamond hour marks, has a sapphire crystal, magnified date indicator, a stylish Excellent VS-1 clarity/Colorless F color diamond bezel and has a stylish 18K gold Rolex Presidential band. Trending at $7,666.65eBay determines this price through a machine learned model of the product's sale prices within the last 90 days. Rolex logo on a 18k yellow gold crown. 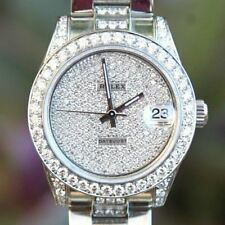 Silver rhodium dial with original Rolex diamond hour markers. Date calendar at 3 o'clock aperture. Rolex box and papers. Box & papers. Stainless steel and 18k yellow gold oyster bracelet with a fold over clasp. Rolex Datejust 41mm Stainless Steel & Everose Gold Jubilee Bracelet Watch 126331. Reference Number 126331. Watch Model Datejust 41. Box Rolex box. Papers Rolex papers. Bracelet Stainless Steel / 18K Rose Gold. This watch is a Stainless Steel Watch made to look similar to the more expensive White Gold one. Model Number 116200. Model Number: 116200. The pink diamond dial is custom on this watch. The bezel is also custom. Rolex logo on a crown. Silver linen dial with raised baton hour markers. Bar shaped hands. Date window at 3 o'clock aperture. The watch is covered by Swiss Watch Expo one year warranty on anything but abuse. Model: Datejust. This is an authentic Rolex watch with an original Rolex 18K yellow gold/stainless steel jubilee bracelet, a Rolex dial with added genuine diamond markers, a custom 18K yellow gold diamond bezel, and added genuine diamonds on the lugs. This is for 100% Original Gray Rolex Dial. Compatible with model 1500 etc. This is the perfect piece to add to your collection! back to you within 24 hours. Model: Datejust. This is an authentic Rolex watch with an original Rolex 18K yellow gold/stainless steel jubilee bracelet, a Rolex dial with added genuine diamond markers, and a custom 18K yellow gold double row diamond bezel. 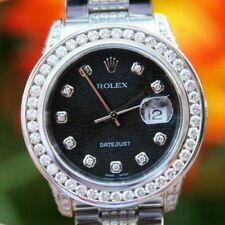 This watch is 100% Genuine Pre-Owned Rolex DateJust Model with Custom Diamond Bezel. 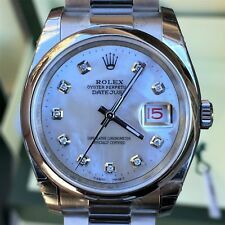 This is a 100% Genuine Rolex Stainless Steel Oyster Perpetual Datejust watch with 2 ct. t.w. of genuine diamonds added to the bezel. Reference 179173, Ladies Datejust Warranty Certificate. -Rolex Datejust Booklet. ROLEX Box Set. -Rolex Factory Service Booklet. -Green Box.